Sadly many cities around the globe share this plight. And concerns about the health impacts of air pollution (particularly, exposure to fine particulate matter—PM2.5) only continue to mount. (Note: Indoor air pollution is even more of a concern in certain regions of the world, but I’m only focusing on outdoor air pollutants for this piece.) Just in the last 10 days several different research studies on air pollution were published—results, respectively, showed associations with brain tumors in children, childhood leukemia, type 1 diabetes, and Alzheimer’s Disease biomarkers in children. That last one made me stop cold. What? Kids are now getting Alzheimer’s? Of course it’s more complex than that, but this research, conducted in Mexico City and published in the Journal of Alzheimer’s Disease and Parkinsonism, suggests that children’s long-term exposure to air pollution increases their risk of Alzheimer’s. Mexico City, like Kathmandu, is a huge metropolis in a valley surrounded by tall mountains. In this kind of geography, air stagnates under a high pressure thermal inversion that can trap the pollution for days, even weeks. The more hopeful news is that cities such as Mexico City, Los Angeles, Beijing, and Delhi have all instigated efforts to address these outdoor air pollution issues, a few with marked success. But we are far from reducing PM2.5 levels, not to mention other air pollutants, such as ozone, to what might be considered acceptable levels (if there is such a thing). Even London’s pollution is on the rise again, according to an article in last Sunday’s New York Times. After thousands died in London in 1952 during the “great killer fog” (pollution mostly from coal and wood burning used for heating), the British passed a Clean Air Act. But with increasing car usage in London now, air pollution is apparently escalating too. All of this is to underscore that we can’t wait until the last “Shangri-las” on the planet go up in smoke and Alzheimer’s becomes a disease of younger generations. We encourage you to continue to use the best available science that CHE highlights in multiple forums to grow public demand for prevention-oriented, health-protective actions and practices. 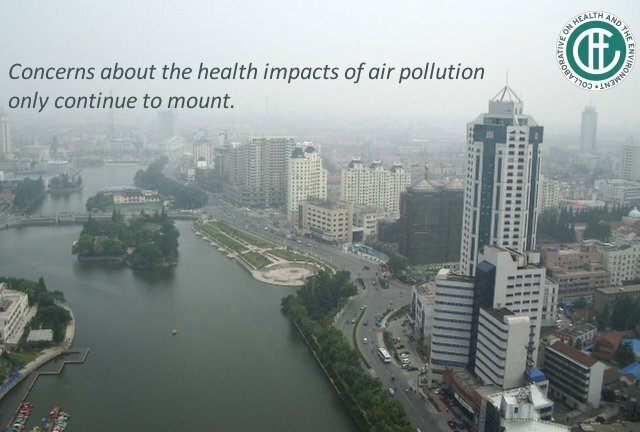 This entry was posted in Newsletter introductions and tagged air pollution. Bookmark the permalink.